Carpets design 19th century. Masterpieces of industrial art. 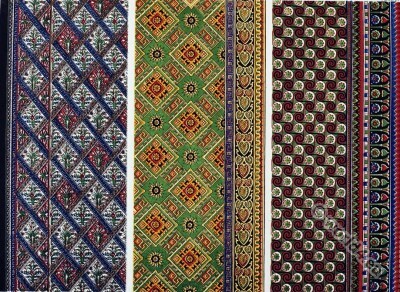 Home » Carpets design 19th century. Masterpieces of industrial art. CARPETS BY MESSRS. HENDERSON & CO., DURHAM, AND MESSRS. FILMER & SON, LONDON. The Messrs. Henderson’s manufactory, which has been established for half a century, is one of the most important in the North of England, and produces every description of carpeting. The pieces we have selected were made under the superintendence and from the suggestions of Mr. John Henderson. Another member of the firm, Mr. William Henderson, has for many years been chairman of the annual meetings of employers and workmen, at which all questions of trade and wages are settled. This system of arbitration in trade disputes has had a most beneficial effect; and when Lancashire was agitated by the Preston strike in 1854, Mr. Henderson and the workmen themselves strongly recommended it to the notice of the Lancashire manufacturers. Having in other parts of this work briefly sketched some of the principal mechanical processes of this branch of industry, we proceed to give a short notice of its history in this country. The word carpet appears to have been applied originally to hangings and coverings of any kind. In the will of Isabella, wife of Sir William Fitz-William, of Elmley, A.D. 1348, “a purple bed with carpets,” and in the will of John, Lord Nevill, of Raby, A.D. 1386, “one green bed powdered with falcons, with the carpets of the same set,” are bequeathed: these carpets were probably coverlets. In Gage’s “History and Antiquities of Hengrave, Suffolk,” mention is made of carpets for windows of English work in the year 1603. The first notice of carpets for floors of rooms is given by Matthew Paris, on the occasion of Eleanor of Castile coming to London, in 1274. He says, “the very floors were covered with costly carpets, and at Westminster she found her apartments adorned with costly hangings like a church, and carpeted, after the Spanish fashion.” This custom of covering the floor with carpets was no doubt adopted by the Spaniards from the Moors in Spain, who naturally held to that ancient Oriental fashion. In this country, however, the custom was of slow growth; fresh rushes were in use even up to the close of the 16th century. Subsequently the floors were of polished wood for the best rooms, as now practiced in France, Germany, and Italy; and it is not till the 17th century that carpets—and these from the East, mostly Turkey and India—came into use among the wealthy. In the 18th century they were in such request as to lead to the establishment of the manufacture in England, founded principally on Oriental designs, and made by the ordinary loom. Kidderminster appears to have been the first place where a factory was established, about the year 1735. Wilton disputes the priority of date; but as the manufacture is stated to have been introduced there by the ninth Earl of Pembroke (1733—1751), it is probably of later origin. Wilton carpets were first made at Kidderminster in the year 1749, and in 1750 carpet-making was established in London by French workmen, who were encouraged by Mr. Moore, by whom the manufacture was so far advanced as to merit a premium from the Society of Arts in 1757, for carpets in imitation of those of Turkey. In the year 1755, a carpet manufactory was established at Axminster, Devon, where Turkish and Persian carpets were imitated with great success. Kidderminster soon took the lead in this manufacture. About the year 1775 there were about 250 looms, and in 1814 1,000 looms at work; the brilliancy and durability of the colours of Kidderminster carpets being ascribed to the peculiar properties of the water of the river Stour for dyeing and scouring. During the present century, Glasgow, Kilmarnock, Bannockburn, and Aberdeen, have largely engaged in the manufacture, and with the fabrics of Yorkshire, Durham, Lincolnshire, and Westmoreland, occupy the largest number of hands. Kidderminster in the year 1851 had 2.000 looms at work, chiefly occupied in weaving Brussels carpets. Halifax boasts of the largest establishment, belonging to the well-known house of Crossley. The number of looms in Great Britain was estimated at 4,000 in the year 1852, and their produce was valued at £1,000,000 sterling, the increase being about 30 per cent, in the last seven years up to that date. 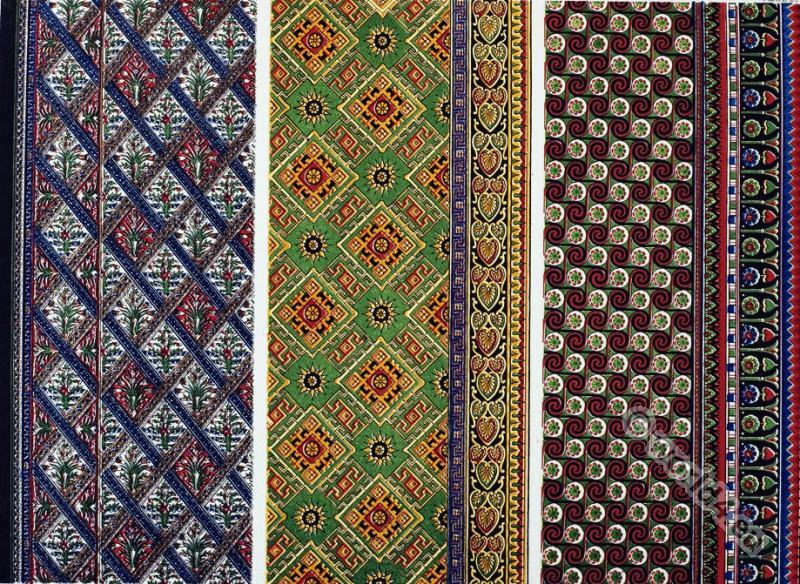 The exports of carpets and carpeting from Great Britain in 1861 reached the large amount of 4,067,351 yards, valued at £508,652 sterling. A PRIZE MEDAL was awarded to the Messrs. Henderson by the International Jury for “samples of various carpeting; for excellence of design, colour, and manufacture.” The Messrs. Filmer, though not manufacturers, had several very excellent pieces made for them from designs furnished by them, and obtained Honourable mention for “carpets designed in competition by students of the South Kensington School of Art, and for general merit: ” one of these is given in the accompanying illustration. From the book: Masterpieces of industrial art & sculpture at the International exhibition, 1862. Selected and described by J.B. Waring. This entry was posted in 1860, 19th Century, England, Victorian period and tagged Carpet, Masterpieces, Victorian fashion on 8/20/15 by world4.